The Chicago Jobs Council (CJC) supports the concept of a system where job seekers of all skill levels and incomes as well as employers of all sizes and industry types can get the workforce development assistance they need. Developing public institutions that are free of categorical eligibility requirements and are alternatively driven by assessment of need is a long-term vision we promote. 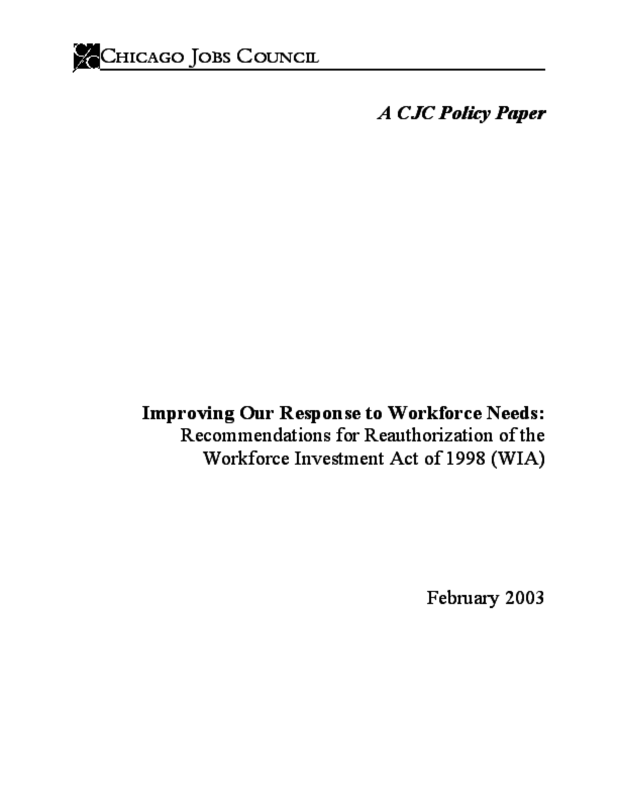 However, in the first couple of years of Workforce Investment Act (WIA) implementation, we have seen how the nation's most needy job seekers were negatively affected by the mandate that local areas create "universal access" without the necessary resources or capacity to do so. The lack of unified planning by federal and state agencies, the existence of misaligned program requirements and performance measures, entrenchment of state agencies, and significant budget crises at the state level have put WIA's universal access goal out of reach. Rather than supporting effective strategies that help job seekers with the fewest skills access career path employment and supporting needs of employers for qualified workers, time and funds have instead been poured into developing the infrastructure for local one stop systems that often do not meet their needs. Through reauthorization, we urge our congressional leaders to refocus WIA to achieve four primary goals: - Stable, quality employment for the chronically unemployed - Job advancement for low-wage adult workers entering the labor market - Skill attainment by low-income adults with limited education - Access to work experience, literacy and English as a Second Language instruction, high school or General Equivalency Degree (GED) completion, and post secondary education for low-income youth Employers will benefit equally from this refocusing. As baby boomers begin retiring and the global economy continues to produce widening skills and wage gaps, the public workforce development system must address the large population with limited academic, technological and vocational skills. Despite a downward-turned economy, many employers in several sectors such as health care and manufacturing report job openings that have gone unfilled because of a dearth of qualified candidates.